The Churro were the first domesticated sheep in the New World, and, by most historical accounts, were brought to the Southwest by Spanish Conquistadors in the 1500s. Over the next three centuries, Churro sheep and the Navajo Indian Nation wove a life together living in harmony and in balance with nature. 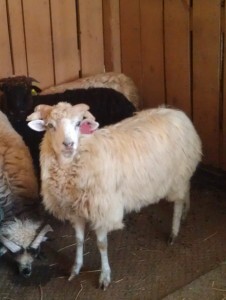 Navajo-Churro sheep are descended from the Churra, an ancient Iberian breed from Zamora in Western Spain. The Churra (later corrupted to “Churro” by American frontiersmen) was prized by the Spanish for its remarkable hardiness, adaptability to extremes in climate, resistance to disease and excellent mothering instincts. Their wool consists of a coarse, durable, protective near greaseless outer layer and a soft, lustrous inner layer. They possess the polycerate gene that produces up to six or more horns. The Churro were the first domesticated sheep in the New World, and, by most historical accounts, were brought to the Southwest by Spanish Conquistadors in the 1500s. Over the next three centuries, Churro sheep and the Navajo Indian Nation wove a life together living in harmony and in balance with nature. In 1868, a treaty was signed, and a reservation was established within a portion of Navajo Country (Dine’tah). The Navajo returned to their homeland and were issued two “native” sheep per person from Hispanic flocks. By 1930, because the Navajo were such good shepherds, their mixed flocks grew to 574,821 sheep. The U.S. government then felt the flocks were causing premature siltation on a new dam being built on the Colorado River named Hoover Dam. In 1934, the federal government initiated a Stock Reduction and roughly 30% of each Navajo household’s sheep, goats and horses were slaughtered by government agents and piled in canyon ravines or burned. This terrifying Stock Reduction is still vivid in Navajo memory. Slightly over 1 million sheep, goats and horses were killed during this era. Even today, you can still find remains of all those livestock exterminated. By the 1950’s, Navajo children were ordered by the government to boarding schools, where they were punished for speaking Navajo and taught to be “civilized”. Since schools were often far from home, the children missed ceremonies vital to Navajo culture. They no longer herded sheep with their grandparents, where they heard stories of their people and lived their culture. The Navajo families that hid in the canyons had successfully maintained original “old type” Churro flocks in these isolated areas where no other sheep breeds were introduced. Sheep meat, milk, wool for weaving and sinew for thread had sustained the Dine’ (Navajo) for centuries. Even today, the phrase Diné be’ iiná meaning “Sheep is life,” is a strong belief in traditional Navajos. Residents of the Navajo Nation believe that sheep symbolize the good life of living in harmony and balance on the land. According to Elders, it is because of this unique animal that the Navajo population increased. “Sheep are like our parents. They feed us and comfort us and we do the same for them.” The Navajos are connected to the Churros with songs, prayers and ceremonies. In the 1970’s, the “old type” Navajo sheep had dwindled to less than 500 head. Criteria for the breed had been established from data collected for three decades (1936 – 1966) by the Southwestern Range and Sheep Breeding Laboratory at Fort Wingate, New Mexico. By 1977, several individuals began acquiring Churro phenotypes with the purpose of preserving the breed and revitalizing Navajo and Hispanic flocks. Dr. Lyle McNeal, a professor of animal science at Utah State University, formed the Navajo Sheep Project to revitalize this breed and keep it from further depletion. Through the efforts of Dr. McNeal and individual sheep breeders, along with the assistance of conservancies such as the CS Fund, the American Livestock Breed Conservancy and Ganados del Valle, the Navajo-Churro Sheep Association (N-CSA) was formed in 1986. The name “Navajo-Churro” was chosen to honor both their Navajo and their Spanish heritage. There are currently over 4,500 sheep registered with the N-CSA, an estimated 1,500 on the Navajo Reservation and several hundred undocumented sheep in the U.S., Canada and Mexico. Diné (Navajo) weaving is a sacred art, embodying creation stories, prayers and ceremonial practices of the ancient and historical past. In weaving, the individual preserves hózhó, the concept that combines order, beauty, balance and harmony. Navajo weavings are like a language with symbols that carry meanings embedded with specific historical, cultural and familial contexts. One of the more important themes in Navajo weavings is the attribute of colors and their multiple meanings. In addition to blankets and rugs, Navajo weavers also produce other woven items including saddle cinches, dresses, sash belts, leggings and socks. According to Navajo legend, it is said that Spider Woman instructed the Navajo women how to weave on a loom which her husband Spider Man told them how to make. The crosspoles were made of sky and earth cords to support the structure; the warp sticks of sun rays lengthwise to cross the wool; the heddles of rock crystals and sheet lightning to maintain the original condition of fibers. The batten was a sun halo to seal joints; and a white shell made the comb. There were four spindles—one a stick of zigzag lightning with a whorl of coal, the second a stick of flash lightning with a whorl of turquoise, a third a stick of sheet lightning with a whorl of abalone, the fourth a rain streamer with a whorl formed of white shell. Still today when a baby girl is born, Navajo parents rub a spider’s web on the arms and legs of the child to make sure her fingers will never tire when she weaves and that the Spider Woman’s gift will be passed on. It is said that the Dine’ are protected by Holy Breath, the wind, and were put on their land with their sheep from the beginning. They were told to remain with their sheep. The children born on Navajo land have their umbilical cord buried in the sheep corral in order to symbolically tie the child to the sheep and to the land. Their being is there and they will always think of where they were born and always return there. This is their way of life. Please contact us if you are interested in purchasing one of our Miniatures or Rare Breeds.